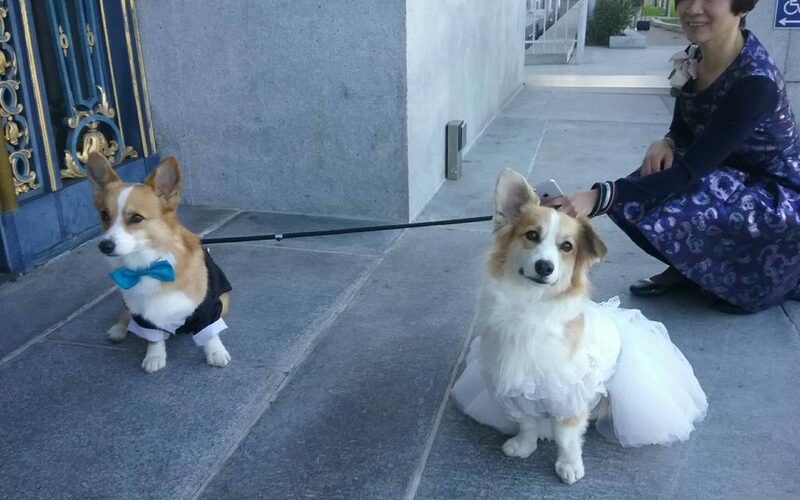 It takes a lot to turn heads in jaded San Francisco, but this qualifies: a pair of corgis in full nuptial regalia wandering through city streets. “Ginger” and “Wally” may not be a well-matched couple, however. First off, he’s 3 and a half and she’s only 1 and a half — an awkward February-April romance. And he’s her uncle. Not even Bill Wyman had such a gnarled family tree. Actually, check that: He did. Ginger and Wally are owned by Peter Chen and Gracie Pan, who, coincidentally, were also married on Oct. 29 at City Hall. What are the odds? PreviousFood trucks: Are rolling restaurants the answer to city-mandated earthquake retrofits?